We recently built a new deck off the north side of our home. It was a side of the house we rarely used off the laundry room but had a back door to that led to nothing but grass. Of course, now that we have to pass through the laundry room to get to it, I was beginning to notice that I hadn't updated the room in so long and the paint in there was somewhat dark, which I'm not a fan of. So time for an update. Hubby came home with a piece of a picket fence that started it all. First I got rid of the dark paint and covered the walls in my favorite color, Simply White by Benjamin Moore. Then I added white hooks purchased at Lowe's to the picket fence section and hung it on the wall. I happen to love straw garden hats and had a collection of them, so, I chose my favorites and hung them from the fence. The fence piece was in perfect shape so I didn't need to do anything to it. I gathered some old soda bottles at our shop because I loved the shape and pop of red color and filled one with faux flower stems. Hubby also found a chippy old screen door that I just fell in love with as is. And I love being in the laundry room when it's cool out with a breeze blowing through so a screen door was a must. The paint is chipping off to reveal two different shades of white and I love that so I didn't want to repaint it. The door didn't have a doorknob and I wanted something unique. I happened to find this thing in the back of my hubby's truck so he drilled a couple of holes in it and voila....the perfect doorknob. I absolutely love it! And now the laundry room seems so much brighter and bigger for this tiny room. And this deck, which was my hubby's dream, has become our favorite place. :) More pics soon! There really is nothing quite like a relaxing summer morning. Truth be told, our porch swing was a little on the uncomfortable, ugly side so I wanted to do something to make the swing just as dreamy. I came across this photo on pinterest and thought disguising the ugly chain with heavy rope was so clever, not to mention fun and whimsical, so that's what I did. I picked up the rope at our local farm store and had them cut it to the size I wanted. It cost me about $10 for 25 feet. I wanted to have plenty to wrap around the chain on the swing. Isn't it fun!? I'm so happy with it. Of course, I had to make some new pillows to make it all comfy too. 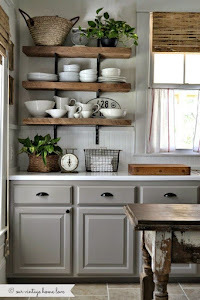 :) So, if you're a detail oriented personal like me and don't like the chains on the swing, here's a great way to hide them. Our front porch, as well as the exterior of our house, has had some changes and updates that I will share soon! Take care! Hope you're enjoying your summer!